If you have Scottish heritage, it is more than likely you will get married in a kilt. In fact, a recent survey found that 91% of Scottish males got married in a kilt, according to Kilts.com. But, what kilt should you buy for your big day? The first thing you should do in our opinion is choose your tartan. This will often involve looking through a “tartan database” of all the available tartans that a kilt supplier offers. This can sometimes be over 2000 tartans, so you need to filter through a lot to find the one you like. Check your surname first to see if it is available, but if not, you may wish to select a more generic tartan such as the Black Watch tartan or Flower of Scotland. From our experience, most people choose an 8 Yard Kilt. This is the most authentic type of kilt which gives you the best quality. What to Wear with Your Wedding Kilt? For those looking for a timeless look, you should consider buying a Prince Charlie Jacket and Vest, with maybe a winged collar shirt and a dark bowtie. As far as footwear is concerned, I would select cream kilt hose with a pair of black Ghillie Brogues. If you are looking for a more stylish look, you may wish to select the Argyll Jacket and Vest with a freshly ironed white shirt and a black ruche tie. Avoid white kilt hose with this style and instead select black kilt socks (hose) with Ghillie Brogues. Spaniards who wear the falda escocesa, tend to inject some of their Spanish heritage into their outfit too. Make sure you buy a sporran. Your kilt will look very strange without one! For a formal occasion such as a wedding, we would recommend you select a dress sporran, which often features animal fur. Other accessories you may wish to select include a sgian dubh. This is a small knife that you can hang out of the top of your sock. Don’t feel you have to buy a sharp metallic knife, as it will stay in your sock for the duration of you wearing the kilt. This means many people wear a plastic sgian dubh. Another additional accessory to buy is a kilt pin. The pin is thought by many to carry little functional use, but it is good for keeping the flaps of your kilt together. 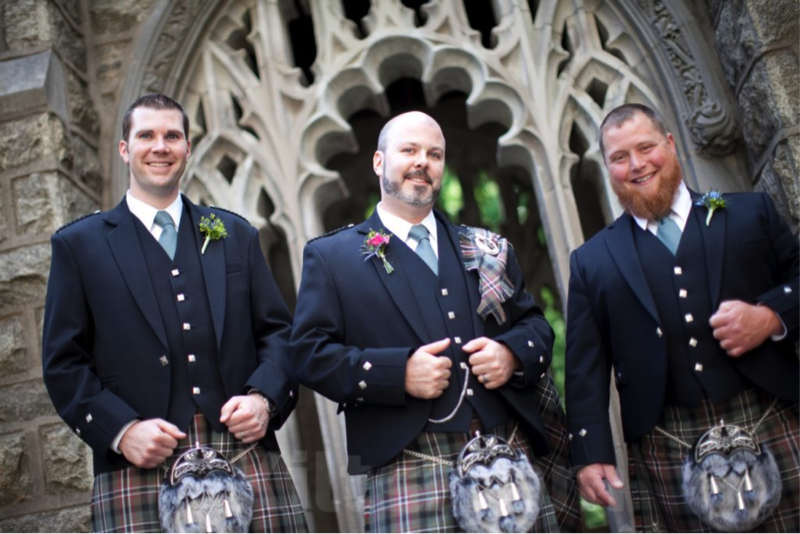 If you are purchasing a kilt for your wedding, your kilt supplier will be on hand to help you every step of the way to help you get measured up. So fear not, and enjoy your wedding!